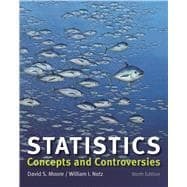 by Moore, David S.; Notz, William I.
David Moore and William Notz’s Statistics: Concepts and Controversies (SCC) introduces liberal arts majors to statistical ideas—and shows them how use those ideas to think about the statistical claims they see every day from polls, campaigns, advertising, public policy, and many different fields of study. The ultimate goal is to equip students with solid statistical reasoning skills that will help them understand impact of statistics on all aspects of our lives. The new edition offers SCC’s signature combination of engaging cases, real-life examples and exercises, helpful pedagogy, rich full-color design, and innovative media learning tools, all significantly updated. David S. Moore is Shanti S. Gupta Distinguished Professor of Statistics, Emeritus, at Purdue University and was 1998 president of the American Statistical Association. He received his A.B. from Princeton and his Ph.D. from Cornell, both in mathematics. He has written many research papers in statistical theory and served on the editorial boards of several major journals. Professor Moore is an elected fellow of the American Statistical Association and of the Institute of Mathematical Statistics and an elected member of the International Statistical Institute. He has served as program director for statistics and probability at the National Science Foundation. In recent years, Professor Moore has devoted his attention to the teaching of statistics. He was the content developer for the Annenberg/Corporation for Public Broadcasting college-level telecourse Against All Odds: Inside Statistics and for the series of video modules Statistics: Decisions through Data, intended to aid the teaching of statistics in schools. He is the author of influential articles on statistics education and of several leading texts. Professor Moore has served as president of the International Association for Statistical Education and has received the Mathematical Association of America’s national award for distinguished college or university teaching of mathematics. William I. Notz is Professor of Statistics at the Ohio State University. He received his B.S. in physics from the Johns Hopkins University and his Ph.D. in mathematics from Cornell University. His first academic job was as an assistant professor in the Department of Statistics at Purdue University. While there, he taught the introductory concepts course with Professor Moore and as a result of this experience he developed an interest in statistical education. Professor Notz is a co-author of EESEE (the Electronic Encyclopedia of Statistical Examples and Exercises) and co-author of Statistics: Concepts and Controversies. Professor Notz’s research interests have focused on experimental design and computer experiments. He is the author of several research papers and of a book on the design and analysis of computer experiments. He is an elected fellow of the American Statistical Association. He has served as the editor of the journal Technometrics and as editor of the Journal of Statistics Education. He has served as the Director of the Statistical Consulting Service, as acting chair of the Department of Statistics for a year, and as an Associate Dean in the College of Mathematical and Physical Sciences at the Ohio State University. He is a winner of the Ohio State University’s Alumni Distinguished Teaching Award. 1 Where Do Data Come From? 3 What Do Samples Tell Us? 9 Do the Numbers Make Sense? 21 What Is a Confidence Interval? 22 What Is a Test of Significance?